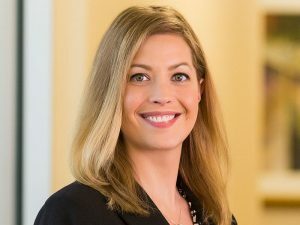 EDINA, MN – January 21, 2019 – Hellmuth & Johnson, a Top 20 Minnesota law firm, announced today that attorney Rachel M. Dahl has been named partner. Rachel’s practice includes comprehensive estate planning, probate and trust administration, asset protection planning, business formation and succession planning, farm business formation and succession planning, real estate, business, and agriculture law. As a member of Hellmuth & Johnson’s Estate Planning team, Rachel works with families to design estate plans that meet their individual needs and goals. This includes: drafting wills and trusts; utilizing disclaimer, credit shelter, and power of appointment planning provisions; providing estate and gift tax analysis; and drafting life insurance trusts, asset protection trusts, special and supplemental needs trusts, and charitable giving trusts, etc. Rachel also represents individual and corporate trustees and fiduciaries on a full spectrum of estate and trust matters. Expanding on her estate planning practice and utilizing her experience in real estate and business law, Rachel routinely works with business owners and farm owners on their comprehensive succession planning needs. In order to provide greater planning options and services to her clients, Rachel is licensed in three jurisdictions, Minnesota, Iowa and South Dakota. Hellmuth & Johnson, a Top 20 Minnesota law firm, represents clients ranging from individuals and emerging start-ups to multinational Fortune 500 companies. Focusing on transactional law, litigation and appeals, Hellmuth & Johnson attorneys are leaders in their fields. Founded in 1994, Hellmuth & Johnson has become one of Minnesota’s fastest growing law firms. Learn more at www.hjlawfirm.com.